Yeah, live broadcasting is always interesting. You plan for things to go in a certain direction … and then they don’t! You have to be quick on your feet, switch from first to fifth gear in a moment, follow up with this, scratch that, speed up, slow down, go with the flow, and turn things around on a dime. All while being precise and concise. Watching the clock ‘to the second’, observing signals from your producer, making sure that what you’re talking about – and makes perfect sense to you because you’ve read the book, seen the film, done your research – also makes sense to listeners and viewers who may know nothing of the subject you’re talking about. On top of that, you have to coexist with the nuances of the Live Air Studio’s state-of-the-art technology (which, trust me, can be just as temperamental as down-home tape-your-wires-together technology). Add to the mix human beings, human states, human events, human’s changing schedules … and you get the picture. Be prepared for anything. Last week, I was engrossed in conversation with author Patricia Cornwell and realized my next scheduled guest, literary journalist Gail Sheehy, was due on air in four minutes. 12:26:28 p.m and counting down. I’m about to announce Patricia’s upcoming Seattle visit bringing the interview to a smooth close, when my producer burst in from the auxiliary booth, and thrust a piece of paper under my nose. Since Cornwell’s in the heat of pre-launch madness for her latest book, I expected she’d have to jump on another call, leave for a meeting, get on the road. We talked for the whole hour and I could have continued for another. We laughed, got serious, and Patricia shared some great insights into life, writing, and success. I’d like to share a little of that interview with you today. Vicki: My first guest today knows plenty about guts, resilience, and smarts. She has one of the most familiar names in contemporary fiction, as does her prime character, Dr. Kay Scarpetta. I’m talking of #1 New York Times bestselling author, Patricia Cornwell. She’s celebrating her 25th year in publishing this year and is known as the leading pioneer in what was a little known genre that has now become a multi-million dollar industry. Today, Cornwell’s novels and characters are known the world over. More than 100 million copies of her books have been sold in 36 languages and 120 countries. 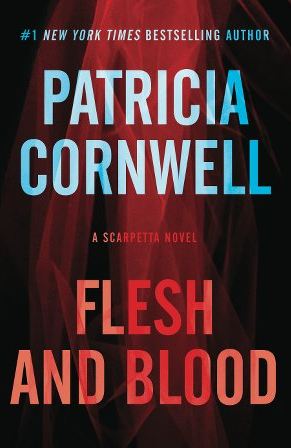 Beyond the Scarpetta series, Patricia Cornwell has authored a book on Jack the Ripper, a biography, and two more fiction series, among others. She’s often featured as a forensics expert on shows like CNN and Good Morning America. Patricia Cornwell, welcome to the show. Patricia: Thank you. It’s great to be with you today. Vicki: I should say your new book, due for release November the 11th, is called Flesh and Blood. It is the 22nd in the Kay Scarpetta series. Patricia: That’s exactly right. I think people are going to have a lot of fun in this book. Vicki: There’s a nemesis that revisits. Patricia: Well, it’s going to be a bit of a shock. The ending is without a doubt the most startling of any of the books I’ve done so far. It’s going to be interesting to see how people react. Vicki: I still have that to come. I’m about four-fifths of the way through. I didn’t quite make it to the end yet. Patricia: I won’t tell you. Vicki: No, don’t. Do not do that. Let’s talk about the first novel you sold. It was Postmortem, published way back in 1990. I remember reading that and being thrilled I’d found a “new author” … can’t believe it’s almost 25 years since your first book came out. That book went on to win the Edgar, Creasy, Anthony, Macavity Awards, the French Prix, it was the first book ever to achieve all those distinctions in a single year. When I read that I thought, “Way to put yourself under pressure there!” Did you feel that? Patricia: I’m so grateful I won them when I did. Postmortem really needed all those awards. I don’t think any book has done it since, either. It’s really kind of bizarre … and it started so humbly in that, Scribner’s (now Scribner), accepted Postmortem literally by a thread. This was my fourth novel. I’m on the cusp of having four rejected novels at that point. So, that “might” was supposed to be good news. At least it wasn’t a flat out “no” this time … eight other publishing houses had turned it down. When Postmortem came out with the whopping big first printing of 6,000 books and a $6,000 advance with no publicity, no marketing, no nothing, it needed to win five awards for people to pay attention to it. Back then nobody knew what to do with forensic labs or autopsies; or a woman who worked in that world. They weren’t sure the public was going to like it. Vicki: Tell me where your fascination with forensics came from … you started out at the Charlotte Observer, helping to put TV Guide lists together. You then went on to become a police reporter and a volunteer cop. At what point did you become interested in forensics? Patricia: I think it goes back to two very important facts about my own life. The first, when I was a kid … I had this pipe dream that I was going to be an archaeologist. I wanted to do archaeological excavations and I read everything about it that I possibly could. When you think about it, a forensic investigation is like an archaeological excavation where you are taking pieces and parts and flecks of paint, even human bones, human remains, and you’re trying to reconstruct death … the life that preceded it … and an entire civilization, to figure out who these people were and why they ended this way. That’s really what we do with a homicide scene. My mind kind of works that way anyway. Then the second thing is my favorite holiday was Halloween. You put those two together and you end up with a monster like me. Literally, when I was starting out as a police reporter at the Charlotte Observer, I remember my first homicide scene and the police would not let me go in. They were carrying the body out and taking it away and there was broken glass and blood everywhere. I was so frustrated because I wanted to know, where are they taking that body? What are they doing with it? This was 1979, 1980. Nobody really knew the answers to that back then. All you ever knew is that you’d run into a detective who carried with him the stench of the morgue because he had just been with the medical examiner. That was about as much as I could ever find out, the odor that went along with it. People did not know back in those days what we know today. I became insatiably curious. The body, really, truly is the most important piece of evidence. What are they doing? What are these injuries? What did this person do to this individual? What can we tell from it? That led me to doing that sort of research later on in the mid-1980s when I decided I wanted to write crime novels. Vicki: Since your prime character, Dr. Kay Scarpetta, performs these autopsies, one might think you have a fascination in being there yourself … but I read that you actually find it difficult to attend autopsies. Patricia: I do. I’ve seen thousands of them. It never gets any easier. In fact, I think it gets harder. When I used to work in the medical examiner’s office, and I was there six years, I could deal with anything after a while. I would go down there every morning and help in any way I could. The most horrible things … it’s not even so much what you see … smells are really hard for me. It’s horrible. Let’s be honest, to subject yourself to that is not an easy thing to do. In order to write about this character I had to wear her shoes. I know what it feels like to pick up a brain and put it on a scale, to look at bloody clothing and try to figure out what it’s telling us in terms of the stab wounds or the cuts in the cloth, bullet holes, all these different things. None of it is necessarily pleasant. To be my character when I’m writing these books, I have to get way beyond that. These things don’t phase her. They shouldn’t phase her. I’m always mindful when I go to a medical examiner’s office, that these are real people who died. I might be doing research, but it’s a very harsh reality. It’s depressing. I’m usually in a horrible mood when I leave. I’m usually very fatigued and sometimes kind of down in the dumps, because even the energy in this place is tragic, awful, and I wouldn’t wish that anybody see a lot of this. I save people the pain of it and give them the pleasure of being curious when they read my books … but they don’t have to go through what I did to get there. Vicki: Many have said the reason your books are so successful is because you are so dedicated to realism. For example, you have a character who is Dr. Scarpetta’s niece, Lucy. She flies a helicopter. You didn’t just go to a helicopter pilot and say, “Hey, tell me what it’s like to fly a helicopter.” You learned to fly the helicopter yourself. Patricia: Yes, I did. The funny thing is, I can say after a quarter of a century with Kay Scarpetta, I may have created these characters, but they turned around and created me. I’m a totally different person. I’m a helicopter pilot. I scuba dive. 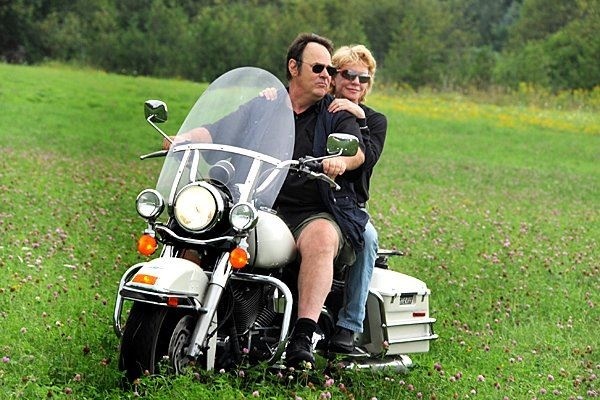 I learned how to ride motorcycles (with Dan Ackroyd, apparently). I know a lot about firearms and other kinds of weapons. There are so many things I have done because I need to feel what these characters feel when they’re doing it. Sometimes I turn that the other way. For example, when I got the chance to go on a dinosaur dig a few years ago, I said, “Okay. I’ve got to do something with this because I know what this feels like now.” What’s Scarpetta going to do with this? It’s not just about reading something. I want to give readers an experience. I want them to know what it feels like to have those instruments in their hands. The cyclic, the stick as they call it, the collective, flying the helicopter. I want them to know what it feels like when you’re 100 feet down on the bottom of the sea looking at a shipwreck. What is Scarpetta feeling? What is she thinking? What is she mindful of? How does she handle her equipment? Does she know what to do in this case or that case? What if there’s an emergency? … the writing experience would be so bleak for me if I could not be tactile and physical about it. I think some of this goes back to being a journalist. Journalists go to the scene. If you’re going to write a great story about something you’ve got to show up. You don’t just ask somebody what it looked and felt like. If you can be there, you’re going to be there. That is the same thing I’ve always tried to do with my books. If I can be there, I’ve got to go. Vicki: You mentioned you’d already written three novels that were rejected. Patricia: I did. I wrote three crime novels and Scarpetta was a character in those first three. She wasn’t the main character, but she was a character. Postmortem was my fourth attempt. When that started being rejected, making the rounds in New York City – this was in 1988 – I started looking for jobs to go back into journalism. I was thinking three strikes and you’re out. Four, you’re a joke. You’re really just laughable now! You need to go do something you can make a living at because clearly you’re not meant to write books. I was at the cusp … the very edge of hanging it up and quitting, when my book finally got accepted. It went on to win those five awards … and things turned around after that. Vicki: 100 million copies later… it’s definitely a testament to sticking in there if you really believe in something. Patricia: I do believe. I say that to everybody. I always say … if acceptance and success is not a measure of who and what you are, then rejection is not a measure of you either. If that were true I wouldn’t be sitting here today. I’ve had tons of failures in life. Many things I’ve tried didn’t work out so well, but I learned something from it. I think that’s very valuable. I think particularly in this day and age where everybody feels entitled to their 15 minutes of fame, you can be successful without really doing anything, because of reality TV for example. We are much more sensitive to thinking that rejection and failure are statements of who and what we are. We are not as resilient as we used to be. Listen … don’t quit! If you believe in something, do not give it up. I always say if you really love something you should listen to that. It might just love you back. Excerpted from transcript of live radio show, edited for length, clarity, readability. Patricia Cornwell went on to discuss how to develop resilience and make it through tough times, the gutsiest things she done, the smartest thing she’s done, and more – November 2014. Full transcript available from Conversations LIVE with Vicki St. Clair. Look at the following list, my friend, and see if you can guess what it inspired: Scrabble. A rock star. A dictionary. Rhyme. Em dashes. A Chihuahua. Cartoons. 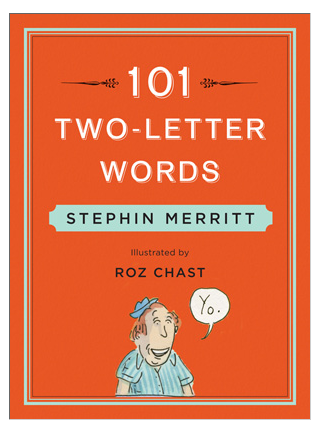 The answer is 101 Two-Letter Words – a book of rhyming poems by Indie rock star, Stephin Merritt, illustrated by The New Yorker’s Roz Chast. Merritt, of course, is the very talented singer-songwriter of The Magnetic Fields. The band’s recorded 10 albums, including 69 Love Songs, named by Rolling Stone as one of the top 500 albums of all time. 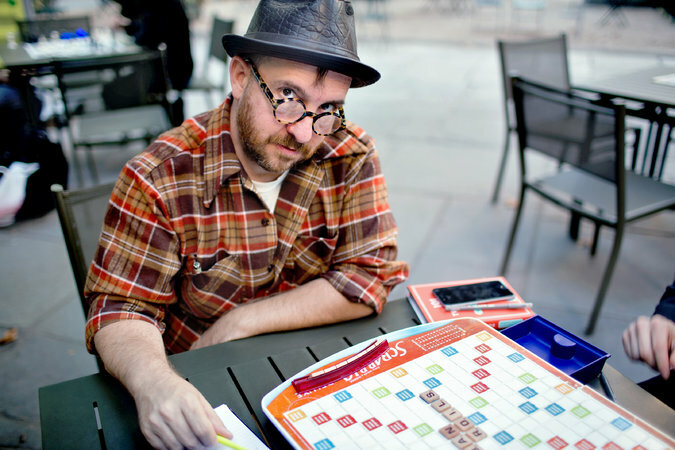 Last month I spoke with Stephin Merritt about the inspiration behind his new book, his favorite poem (think trashy ladies), and his creative process. Unfortunately, the transcript doesn’t capture how much we laughed! Vicki: Stephin, you have a passion for playing Scrabble … which one doesn’t necessarily equate with a rock star (although I was married to a rock musician who also liked Scrabble). But there’s an interesting story behind how you became inspired to write this book. Stephin: As everyone knows, being a rock star is incredibly boring. If it wasn’t … everyone would do it! My life consists largely of waiting around in airports. You can’t actually read anything, because paradoxically, there isn’t enough time to read anything. Basically, I end up spending lots of time playing Scrabble and Words with Friends online. But I couldn’t remember the two-letter words to save my life because I have a horrible memory. So I started making mnemonics for myself, to help me remember the two letter words … gradually, it just sort of turned into a book. My literary agent liked it and shopped it around. Vicki: I love that you included “em” dashes in the book for us writers. Stephin: Oh, yes. Where would modern writing be without the em dash and the en dash, and the extremely subtle distinction? Vicki: Exactly! Your rhymes and Roz’s illustrations make a wonderful, fun combination. Tell us how this all came together … how did you connect with Roz Chast from The New Yorker, first of all. Vicki: That was very serendipitous. Did you guys meet? Did you have input on the illustration? Did you send her notes and ideas? Stephin: I had no input whatsoever, except for the suggestion that the word “artisanal” was misspelled on the illustration of the box of “Fe”, meaning iron. I did go to Roz’s house in Connecticut and met her parrot – which was difficult because I have a phobia of parrots. And and I met her family, which was okay because none of them were children … I also have a phobia of children. Vicki: Let’s talk about some of the two letter words you’ve included. Stephin: Yes. Za and qi are the most valuable ones. You often play a word that will produce just that and nothing else. Vicki: I want to read listeners the one about “em” dashes – because I’m partial to em dashes. I think you had a lot of fun putting these rhymes together. Stephin: I definitely had a lot of fun putting them together. I did what I usually do when I write, which is sit around in bars with a cocktail in one hand and a pen in the other. I just covered 3 x 5 cards with possible two-letter word poems. I don’t remember which order the mother and father are in that one … but anyway, that poem was my lighthouse. Vicki: How do you describe your poems. Stephin: I’d say they’re quatrain. None of them are especially complicated. They’re all essentially the same rhythmically. They are all in pairs. There’s one poem per two-letter word. There are 101 poems. I try to have recurring characters, obvious ones such as Ma and Pa, and less obvious like Vampire Dog. And some of the words fall into patterns like the Scottish “Ay”. Stephin: And in America we say, “Yo!” One day when we’re walking down the street we say, “Yo! Yo!” to everyone we see. Just as the British say, “Oy,” to everyone. There are a thousand little patterns in these deceptively simple two letter words. Vicki: Some of my favorite illustrations are of Vampire Dog, which you mentioned earlier. I think I read somewhere that the inspiration for Vampire Dog was a Chihuahua. Stephin: Oh yes. My late Chihuahua, Irving Berlin Merritt, or Irving for short. He had especially bat-like ears … looked like a deer with the head of a bat. He was often asleep in my shirt while I was writing my poems. Stephin: It’s much easier to be told that you have three minutes to write a limerick or a sonnet, than to be told you have three minutes to write an essay or poem in free meter. I think the formulas we’ve had for centuries – that everyone understands – are easier to work within, rather than inventing your own form every time you sit down. It’s much easier to make a particular food than to invent your own dish every time you try to make lunch. Vicki: Right. Eric Reidar, our producer, is a huge fan of your music and I promised we’d save time for him to ask about your music. I’m going to throw the mic over to him … Eric, come on in. Eric: Okay. Thank you very much. Stephin, it’s a pleasure to talk to you. I’m loving the new book. Vicki loaned me a copy of it today. I’m looking forward to perusing that this afternoon. As a Magnetic Fields fan, and a fan of some of your other projects like Gothic Archies and The 6ths, I’m wondering what’s coming next for you musically. Stephin: I’m working on a mini-musical involved with This American Life. It’s an adaptation of This American Life. Hopefully, it will be its own musical This American Life episode. I’m not sure when it’s supposed to air … I have to finish it first. Eric: I’m a big fan of This American Life as well. I’m also wondering, as much as I love all your albums, I’ve had the pleasure of seeing The Magnetic Fields live several times, and I’ve always thought the live shows were amazing and wondered why there hasn’t been an official live recording out there. Have you ever wanted to put out a live album? Stephin: Hell no! I hate live albums. Vicki: I’m with Stephin on that one. I don’t like listening to all the clapping and cheering every time I listen to the music. Eric: I can understand that, but he’s a great live performer. Stephin: They’re like real albums, only mixed really badly and with too much reverb, and all the endings and beginnings mucked up by having white noise in between. Vicki: I love that “Hell no!” Let’s end on a literary note with my favorite poem … would you read that to us Stephin? Stephin: Yes, this is also my favorite poem … it’s the poem for “As”. 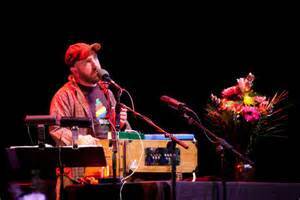 ~ More about Stephin Merritt and The Magnetic Fields at The House of Tomorrow. ~ Photo Credit Bryant Park: Julie Glassberg for The New York Times. Excerpted from an interview with Stephin Merritt on Seattle’s Conversations LIVE with Vicki St. Clair, Talk Radio, KKNW, September 2014. Edited for clarity, readability, and length. I rarely need to purchase books these days—one of the delicious perks of being a radio host. But I still embrace the meditative state of browsing bookstore shelves, trailing my fingers along the neatly aligned spines of multicolored book jackets, hoping to discover a new treasure, a new author, a new idea, a book written just for me. 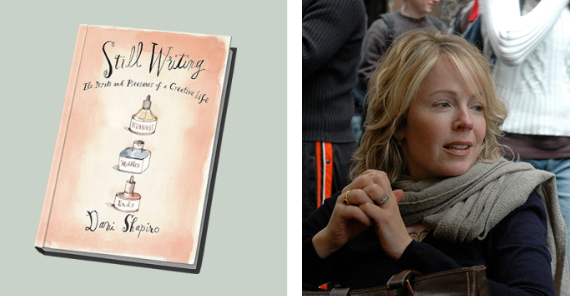 Still Writing: The Perils and Pleasures of a Creative Life by Dani Shapiro. I pick it up, glance at front and back covers. I let the book fall open to the page of its choice. I start reading. I look for a chair and read some more. I read as I wait in line to pay for the book. And when I get home, I lean against the kitchen counter and read as the electric kettle heats up. I pour boiling water into my ‘special moments’ teapot, stirring lemon and ginger tealeaves, and leave them to steep while I curl up on the sofa to get lost in the mind of this exquisite writer. Hours later, I Tweet Dani Shapiro and tell her Still Writing just made it to my ‘favorites’ bookshelf. I invite her on the show and we exchange PR connections. Booking confirmed, show notes prepared, here’s a little of our conversation. Vicki: It’s an interesting title, Dani. I thought, “Why Still Writing?” Then of course, when I got to the end of the book I realized why you called it Still Writing. Let’s start there. Dani: Exactly. I remember the time that Mark came up to me, it was at a party in Connecticut where we both live. This is a guy who he’s 6’5”. He’s this strapping guy who works in enormous hunks of marble and granite. His work is in museums and the best art collections all over the world and on the campuses of great universities. When I realized I wanted to do this book, the title was so clear to me. I remember the moment it came to me. There’s also the double entendre, which is the stillness required to do this work that we do … it’s very real. You can’t do it in a frenetic and noisy environment. There needs to be a quiet and solitude. Vicki: Do you think it’s because it’s creative that people think it’s not sustainable, it’s not real work? As you say in the book, when is enough, enough? What do I have to do to prove myself? I think the person asking it means no ill will, no harm. I think it comes from the feeling of … what can it possibly be to sit down on a daily basis try to make something out of nothing? It sort of flies in the face of the way that most people spend their daily lives. Yet for anyone who creates, for artists and writers, it’s the only thing we can do. Vicki: I could relate to this book on so many levels. I love that you call it a companion to writers. It’s not easy. People joke all the time, “It’s okay for you guys in your PJs all day.” I certainly don’t work in my PJs even though I work from my own studio, but it’s not always easy to get yourself sat down in that chair. There is no real pressure on you unless you have a looming deadline. You talk about this a lot in the book. Dani: Right, there is so much to distract … the longest walk of my day is from the cappuccino maker in my kitchen to my desk. Vicki: I know Monday mornings are particularly difficult for you so I appreciate you being with us today. Dani: Mondays are brutal. I’ve always kept very regular hours as a writer. It’s whatever works for you. Some writers can write in the middle of the night or don’t keep regular hours at all. Some work 7 days a week. I have always, from the very beginning of my writer’s life, worked Monday through Friday, when the rest of the world is working. I think it’s been my hedge against feeling too solitary or out of step or lonely. Much of what I really wanted to explore in the book is the way that I think so many of us get in our own way. Often, some of my worst writing days are the ones that start out completely free of any other distractions or disturbances. Full day open to me, empty house, quiet, phone’s not ringing, no appointment, everything is just as it should be. Sometimes the pressure of that is just too much. If left with nothing else getting in the way between me and my work, I can get between me and my work. I think that’s true of so many of us. It’s a struggle. *2013 Interview excerpt with writer Dani Shapiro. Edited for clarity, length, and readability. Conversations LIVE with Vicki St. Clair.